The summer deep sky doldrums are still upon us. The clouds are beginning to thin a bit, however, and despite a waxing Moon I hope to get out into the backyard at least for some eyepiece testing over the next week or so. This past week? I’ll fess up: the heat and the bugs have kept me inside with our new 4K UHD TV. Any observing I’ve done has been of the virtual nature. Which is OK; astronomy software can be fun to play with indoors on these uber-humid, hazy nights. That is certainly true of most of my favorite programs (can’t do much with PHD indoors, admittedly). Both of these are “planners,” which means they are essentially giant databases of over a million objects apiece designed to allow you to build observing lists and log observations. They are so much more than that, though, with abilities like controlling goto telescopes, downloading images, and, in the case of ST3, producing incredibly detailed star charts. I didn’t completely understand the value of planning software until I began working The Herschel Project in 2009. When I found myself undertaking a project that eventually required me to observe 2500 objects across the entire sky, I knew it would be vital to keep myself organized and informed. What had I seen? What did I still need to see? Could I see a particular object easily with the scope I was using? What would my target look like if I could see it? SkyTools 3 allowed me to do all that. It’s fair to say I’d never have completed the Herschel list in three years without it. Well, sorta. I’m quite sure I could have done just as well with my other top pick, Deep Sky Planner 6. I just didn’t glom onto a copy until the Project was winding down. While DSP doesn’t generate its own charts, that’s not necessarily a bad thing. It allows you to use any one of the most popular planetarium programs for charting. Being able to produce sky maps with Starry Night meant I didn’t have to learn a new charting engine, and that was a good thing. Otherwise? Features right up there with SkyTools. And…I find Deep Sky Planner’s display a little easier to read on a red filtered laptop. Good stuff. Good old Cartes. Everybody’s fall-back freeware planetarium isn’t fancy. It doesn’t have photorealistic skies. It doesn’t include a million images. It won’t give you the weather report for your observing site. What it will do is create legible charts that, depending on the options and add-ons you choose to download, will go as deep as anything on the market. It controls scopes easily with ASCOM, and it has animation features that work well and smoothly. You could do a lot worse for a hundred bucks, much less for free. Stellarium is the other top freeware planetarium, and it, unlike Cartes, does feature nearly photorealistic skies. So why is it ranked lower? For use in the field, it is not quite as good. It includes the entire NGC/IC and a few other catalogs, but does not go nearly as deep as Cartes. It lacks a few controls I find helpful, too, like a button, N,S, E, or W, to quickly select the horizon I want to view. Doesn’t even have a hot key to do that. Still, it is pretty, it is often detailed enough, its animation is crazy-smooth, and it is free. As I’ve written here before, I need a “quick look” planetarium. One that loads quickly and shows me exactly what is up in the sky without a lot of fuss. That is TheSkyX First Light Edition. It is as beautiful as Stellarium, actually moreso, but also has the easy to access controls for selecting the horizon view that Stellarium lacks. Want the eastern horizon? Just push “Look East” on the toolbar. So why do I rank it below Stellarium? Mainly because Software Bisque doesn’t make it easy to get. This lowest “level” of TheSkyX is apparently only available as a pack-in with Celestron and Bushnell products. It’s so good, however, that if you can’t find a copy I suggest you kick it up a notch to TheSkyX Student (50 bucks). Cartes won’t give you the weather forecast for your site, but Starry Night darned sure will, and that is just one of its countless features. This mega planetarium really has it all, including a background sky stitched together from CCD pictures. Millions of stars and DSOs. You name it, really. So why am I still on “6” instead of the current Starry Night 7? In its final version, 6 is pretty much debugged—I never have trouble with it. The current owners of the program, Curriculum Simulations, are continuing to work on 7, and I understand it is getting there, but I don’t think it’s quite as clean as 6 yet. I like to take deep sky pictures. But mainly in an informal manner with a DSLR, not a high-faluting CCD camera. Nebulosity 3 (4 is out now but I haven't tried it yet) is really all I need. It not only lets me control my DSLR from the computer (“tether” it), it features excellent processing tools including a deep sky image stacking program that is the best in the business. To be honest, if I ever move on to a “real” CCD camera, I will still use Neb with it. You know a piece of software is good when it’s what just about everybody including your old Aunt May uses. That is PHD Guiding, a program designed for only one purpose, guiding your mount during deep sky imaging to keep your stars round. Yeah, that’s pretty much all PHD and its open-source successor, PHD 2, do, but it is enough. Man is it ever. Even with my inexpensive Atlas and VX and CGEM mounts, this program just LOCKS ON and guides. Never a problem, never a worry. Deepsky is, like ST3 and DSP, a planning program. In fact, it was the first program of that type I ever used back in the mid-1990s. I liked it then and I like it now. So why isn’t it higher up on this list? Time has kinda stood still for it. It needs a few new features and some upgrades like the ability to rearrange column order. The sky charting module is old and tired-looking and only shows the deep sky objects in your current plan—nothing else. The user-interface could stand some tuning, too. Despite those things, I still use Deepsky; it has some features nobody else does, like a library of log entries from observers like Barbara Wilson that I find very useful. I hope Deepsky's author, Steve Tuma, gets back to work on it in a serious fashion someday. This one is another blast from the past. In its heyday, especially down here in the South, Megastar was the near-invariable choice of serious deep sky observers. It was the first program to use the Hubble Guide Star Catalog, which is what attracted many of us to it early in the 1990s. It also has a very useful catalog nobody else does, the MAC, the Mitchell Catalog of Anonymous Galaxies developed by ace observer Larry Mitchell. Alas, the program’s author, Emil Bonano, apparently lost interest in Megastar and sold it to Willmann-Bell, who have continued to keep it running on new versions of Windows, but have not done much other development on it. Shame. But it is still good and I still like it. A program can look like a refugee from MS-DOS and still be useful, you see. Like PHD, Celestron’s NexRemote is a program that just does one (relatively) simple thing, but does it incredibly well. In this case, the program allows you to run Celestron’s hand control (NexStar) firmware on your laptop PC. Your laptop is then able to take the place of the telescope hand control. Simple, yeah, but a joy. This is another soft that really helped during the Herschel Project. When I was using a deep sky video camera, I could sit under a tent canopy with the monitor and DVR and run the NexStar 11 GPS or the CG5/C8 completely from the PC. That meant I was out of the dew and cold and could go as long as it took to bring home the 100 – 200 objects per run that the H-Project demanded. NexRemote also allowed me to move the scope and do other things with a Logitech Wireless Wingman gamepad, which was really, really cool. I’d got the idea that Celestron had abandoned NexRemote (it is now free), and that would be a shame. I was pleased to hear the rumor recently, then, that Celestron is testing a new version designed to offer some of the features peculiar to the popular VX mount. I hope that is true, because even though the H-Project is history now, I still use NexRemote almost every time I set up a Celestron mount. And that, then, is it. Is there an astro-program I should have considered for this best of the best, but ignored? I’d be happy to hear from y’all about that. Otherwise, I hope to actually do something other than armchair astronomy by next Sunday. Excelsior! What better time for them? Binoculars are the perfect tool for astronomy on cloudy, hazy, humid, bug-infested summer nights when I’m reluctant to drag even the smallest telescope into the backyard. Why bother when all I’ll likely see is the undersides of clouds? I can get up the energy to grab my old faithful Burgess 15x70 binoculars for a quick scan of the summer stars between passing thunderstorms, though. Actually, binoculars are useful for astronomy at any time of year. Not that I, like some people, recommend binoculars as a beginner’s first instrument. 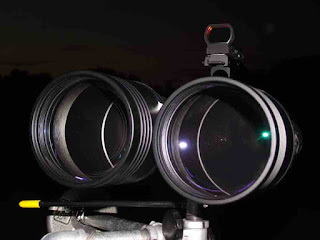 While binocs can be great for helping you learn the constellations, allowing you to pick out the missing stars in the constellation patterns under suburban skies, they are not usually enough to maintain a novice’s interest. Most newbies want to look at the stars, sure, but what they really want is the craters of the Moon, the rings of Saturn, and the Moons of Jupiter. Binoculars don’t do a good job with those things. 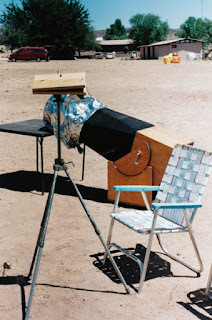 Even expensive interchangeable eyepiece binocs usually won’t deliver the Solar System goods as well as a cheap 6-inch Dobsonian can. Yes, steadily held 15x binoculars can show considerable lunar detail and the Galilean Moons of Jupiter, but not in the close-up fashion beginners crave. Heck, most newbies are disappointed in how small Jupiter looks at 100x in a scope, much less 10 or 15x in binoculars. 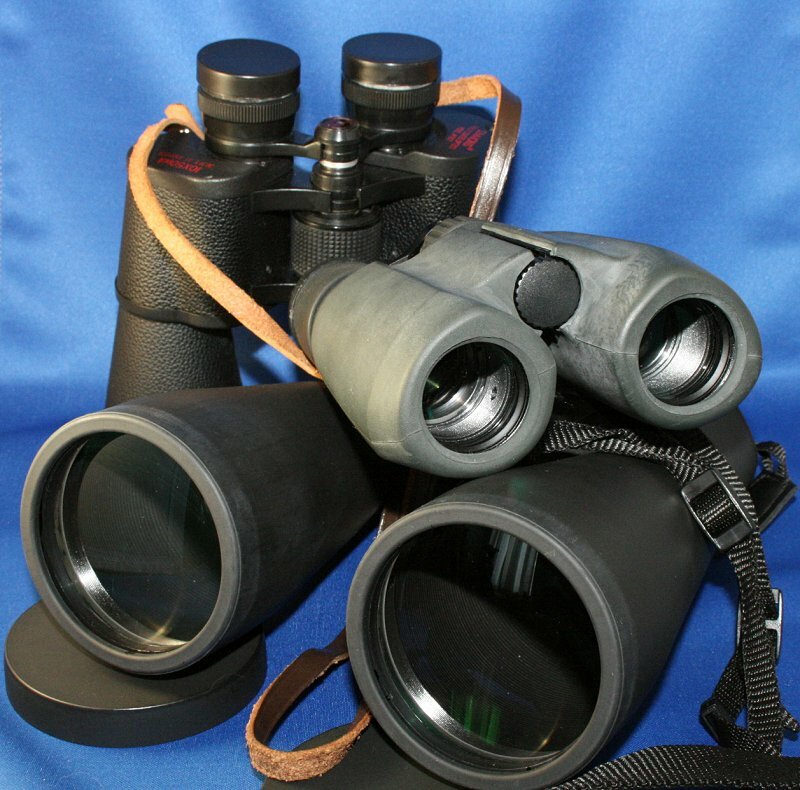 Novices: get a pair of binoculars to supplement, not replace your scope of choice. That said, every astronomer old and new should have binoculars. Not only are they the ultimate grab and go solution, they are handy for doing things like spotting Polaris in the gloaming, picking out a horizon hugging comet, or getting your bearings in a seldom-visited constellation. But you probably don’t want to spend for Canons or Nikons or Fujinons just to do those sorts of things. You want the vaunted El Cheapo binoculars. Finding a pair of inexpensive ones that’s useful for astronomy is, thanks to the flood of Chinese optics, easier than ever. There are some incredible buys out there for binoculars in all sizes from the little fellows to the giants. “Glasses” come in a bewildering array of apertures and magnifications: 8x35s (the first number is the magnification, the second the aperture, the size of the objective lenses), 7x50s, 10x50s, 15x70s, 11x80s, 25x100s and more. Where do you start if you want to add a pair to your arsenal? 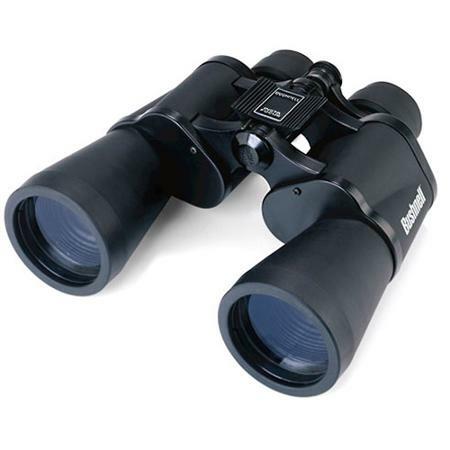 What is the best general purpose binocular for astronomy? Do you want the short and sweet? The good, old 10x50 is best for most amateurs. It is the perfect balance of field size and magnification. Even those not specifically advertised as “wide field” binoculars have big fields of view that allow stunning views of the Milky Way, the Pleiades, M31, and other things too big for almost any telescope. 10x50s also offer enough magnification to show some lunar detail and to allow a glimpse of Jupiter’s Moons. Despite their fairly large aperture and a higher magnification than many smaller glasses, 10x50s are still small enough and light enough for most adults to easily hand-hold for considerable times while observing the sky (after a little practice anyway). How about the lower powered 7x50s? They boast wider true fields of view, but… In binoculars, less power means “won’t go as deep” from most locations. Even from darker sites, you will see dimmer objects with the higher magnification of 10x50s. Higher power darkens the background sky in the binoculars, spreading out any light pollution present. When you are viewing extended objects like nebulae or the Andromeda galaxy, their light is also spread out and they are dimmed too, but even so the darker sky background makes them appear to stand out better, makes the contrast between object and sky seem higher. You will definitely see more stars with higher power binoculars; it won’t just be a pseudo contrast effect either. Stars are not dimmed by increased magnification, since they are point sources and cannot be spread out. The higher the magnification, the darker the sky, and with the stars remaining the same brightness, the higher the contrast. You can see dimmer stars with increased magnification. A little more power has one other benefit. The main impediment to doing the Messier with binoculars is that some of the objects are small enough to be hard to identify at lower power. I find 10x helps me pull out a few more of the little ones than I can at 7x. I can (barely) make out that M57 is not a star in 10x50s; I can’t do that in 7x50s. Stick to 10x50s. Can you go smaller than 10x50s and still see anything? Sure you can. Magnification is really more important than aperture when choosing between 35mm and 50mm binoculars. Also, lighter binoculars are easier to hold steady, and you will see deeper if your glasses are held steady. Our 8x32 binoculars regularly show as much—and sometimes more—than our 7x50s. The catch? Cheap 35mm binoculars are often poor optically. Generally, the cheap brands are less good in that regard than 50mm glasses. Yes, our 32mms give our 50mms a run for the money, but our 32s are rather expensive Canon roof prism binoculars. So, you want a pair of 10x50s. Where do you get them? You could trot down to Wal-Mart and buy a pair for 30 – 50 bucks. That is actually not a bad idea as long as you are willing to stand in the return line and keep exchanging binoculars until you get a good pair. What’s usually wrong with them? Optically most Chinese binoculars, which are all you will find at WallyWorld, are fine. It’s their mechanical alignment that is off. Take your new Bushnell (or whatever) glasses out, and point ‘em at a bright star. Adjust the interpupillary spacing (how far apart the binocular halves are) until you see one big round field of view (not a figure 8 shaped field like in the movies). Focus as best you can and hold the binoculars as steady as you can—gripping them at the objective end is best. 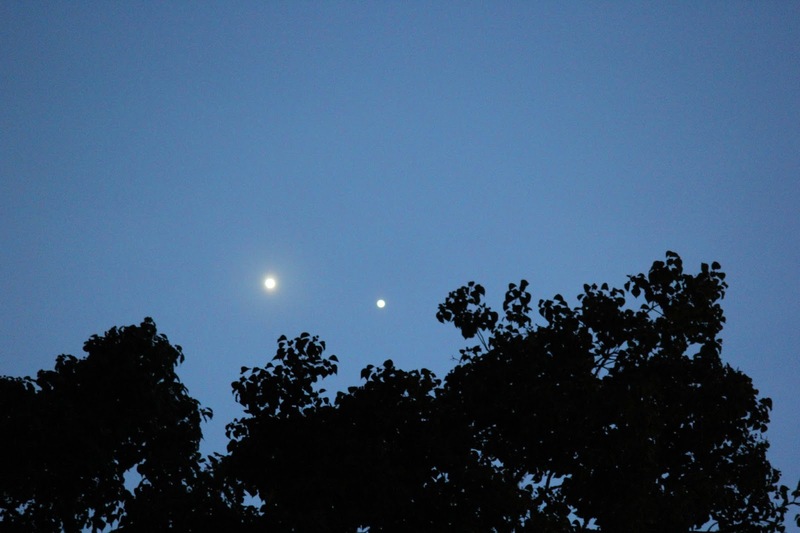 Do you see a single star or a double star? If you see two bright stars instead of one, check focus and fool with the spacing. If your eyes still have to work hard to merge the two images, take the binoculars back and exchange them for another pair. The ones you have will be a headache—literally. Which brand should you choose? Bushnell? Meade? Celestron? Barska? Tasco? It really doesn’t matter. At this end of the price scale, brand names are meaningless. They all come out of the same few Chinese factories and all are more alike than different. Options? Aren’t many offered. See if you can get a pair with a case of some kind. How about a tripod socket, so you can mount the binoculars on a camera tripod (with the help of an L shaped tripod adapter you can get cheaply from most astronomy dealers)? That might make a difference to you; it doesn’t to me. Frankly, I don’t like binocular mounts for non-giant binoculars. But not because they can’t help steady the binoculars and let me see deeper. They can; even a cheap camera tripod will help. It’s because they don’t fit in with the way I use binoculars, especially in the summertime: grab ‘em up, run out on the deck for 10-minutes of looking, run back inside. I don’t want to fool with tripods under those conditions. What can you expect to see in inexpensive 10x50s? A lot. Many Messiers (most of those not visible are not visible because, as above, they are too small). I have had a terrific view of the elusive and difficult M101, the Phantom Galaxy, from a very dark site with a pair of Simmons (WallyWorld) 10x50s. Moon craters in proliferation. Beautiful awe-inspiring views of the summer Milky Way from dark locales. A better look at M31, the Andromeda Galaxy, than I’ve ever had in a telescope. Downsides to the cheapies? Other than the above alignment problems, not many. Mostly just field edge sharpness in wide-field models and fogging up in the summertime when the binoculars are taken out of the air conditioned house. The former isn’t much of a problem; you’ll still have plenty of useable field. Fogging up? Makers of more expensive glasses prevent internal fogging in their binoculars by purging them with nitrogen (external lens surfaces will still fog). Solution? Put the glasses with their lens caps on outside half an hour before you use them on sultry nights. Are there any 10x50s to stay away from? Basically two types: zoom binoculars (of any maker) and binoculars with ruby-tinted lenses. 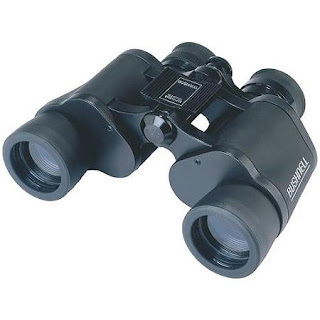 The problems with zoom binoculars are that they are not as sharp as single power binoculars at any setting and their fields of view at lower powers are constricted. Tinting the lenses of binoculars red was all the craze with the cheap sellers for a while. The only reason for doing that, really, would be to lessen the impact of chromatic aberration in the most poorly made glasses. It provided no other advantage and was a tip-off that the binoculars in question would be yucky. Luckily, I don’t see many of these horrors anymore. These are, if you haven’t picked up on it, my favorite astro-binoculars. No, they are not as easy to hand-hold as 50mm glasses, but it is still possible to use them without a support with a little practice. More aperture and more magnification really are a good thing. Not only does pumping the power up take you a bit deeper from less than perfect skies, you’ve got the reach and resolution of bigger objectives, too. At 15x, the Moon looks good, real good, and the Galilean moons are easier because they are more separated from the planet—which is now obviously a little disk. Most astronomy oriented 70mm binoculars are of the wide field variety, so stuff like M31 and the Double Cluster still looks terrif. Brand? Since we are talking bargain glasses, the same applies as with the 50s—it really doesn’t matter. All come from the same factory or two, and all are similar in quality. There are a fewer brands to choose from simply because fewer importers choose to market 70s. Some of the usual players are Celestron, Meade, Barska, and Orion. Amazing to me is how cheap they are: between 60 and 100 bucks gets you a pair. Surprisingly, the low price doesn’t seem to reflect quality. Most I’ve tried have been reasonably well built and optically good. My own Burgess 15x70s set me back all of fifty bucks in 2003 and have been at my side ever since. If 70mms are cheap, 80s are crazy cheap compared to what they used to be, with 100 – 125 bucks getting you a pair of really big binoculars from Celestron, Barska, Orion, and the other usual suspects Sounds great…but. Bigger isn’t always better, boys and girls, at least not in astronomy. Problem one is that none of the low-ballers sell 11x80s in this price range. They are all 20x. Do you think it will be easy to hold 20x binoculars of any size steady? Adding to that is Problem Two: cheap binoculars are generally heavier than expensive ones, and 80mms are naturally heavy whether cheap or expensive. To get much use out of 20x80s you will need a tripod or, way, way better, a mount designed specifically for binoculars. If that is your bag, fine. It ain’t mine. Again, I usually don’t want to be tied down with a mount when it comes to binoculars. Big binoculars, 100mm and larger aperture binoculars, are an entirely different kettle of fish. They are more a telescope replacement than a supplement. They are most assuredly not grab ‘n go friendly in any shape or form or fashion. I use them for tasks that a telescope can’t do as well as they can—showing pseudo 3-D views of wide fields—not because I want something lighter or more convenient. That’s the only way to approach large binoculars. If you accept those things, big dogs, like my 25x100 Zhumell Tachyons, can amaze. I have quite frankly never had as stunning a view of the Sagitarius-Scorpius Milky Way with any instrument as I had with the Tachyons at the Chiefland Astronomy Village. M31? You can’t get a 3-D view of something all those light years away, but that’s not what your brain thinks. You are using both eyes, so you must be seeing in three dimensions. M32 was in the foreground and the whole thing looked just terrific. In some ways the real giants are also more versatile than smaller binoculars. You still get a very wide field, but you get resolution of the brighter open and even globular star clusters. M57 is a tiny perfect ring. Saturn’s ring can be seen (barely). The Moon looks as good, at least as good as in my StarBlast. Despite all that goodness, I use my Tachyons once or twice a year at most. Why? The mount. Large binoculars require mountings. While the Pete Peterson EZ Binocular Mount I built for them is lighter than some similar mounts and works better than most, it’s a fair hassle to set up and balance. That means I reserve the Tachyons for times when binoculars will really shine: a good, large comet, a visit to a dark site when I want to go more casual than setting up a telescope and doing an observing project. Like other binoculars, the Chinese optical revolution has made 25x100s much more affordable than I’d ever have dreamed. You can buy from sources that include Celestron and Orion at prices that range from 250 – 350 dollars. But think long and hard before you do that. You’ll need to budget at least another 150 – 200 dollars for a mount kit (like the Peterson EZ), and several times that amount for a store-bought rig—which likely won’t work as well as the kit. One other caution: if, like mine, your eyes have a hard time merging images in even well collimated binoculars, you may not like 25x power binoculars. The higher the power, the harder it is to merge images. Part of me says that if you want to go big, you should really go all the way, and invest in something like the Oberwerk 100s. These binoculars feature interchangeable eyepieces, an integral fork mount that’s far more convenient than any binocular mount, and eyepieces with a 45-degree viewing angle to make the binoculars more comfortable to use when pointed at higher altitudes. I’ll tell you, if my eyes had an easier time merging images at high power, I would sell several telescopes, get a pair of these pups, and never look back. Despite the few caveats above, binocular astronomy can be a joy. If you’ve never done the deep sky with glasses, it can give you a whole new perspective. I’d always used binoculars for astronomy, but usually only when it wasn’t convenient or comfortable to use a telescope—like this summer. I have, however, gone beyond that a time or two, and observing with binoculars seriously is like opening a new window. I did the Messier, kept going, and was surprised at how far I could go into the night. It was like seeing everything for the first time again, which is a very good thing. Still not much astronomy going on around here, folks. It is hazy and it is humid. It’s a typical Gulf Coast July in other words. The angry thunderstorms have abated—somewhat—however, and the Moon is now getting out of the way, so I hope to see something in the coming weeks. I should have a set of a famous telescope company’s new 100-degree eyepieces to evaluate in the near future, and that will no doubt impel me to get into the backyard and brave the mosquitoes no matter how milky the sky. It wasn’t like I didn’t see anything over the last week or two, though. 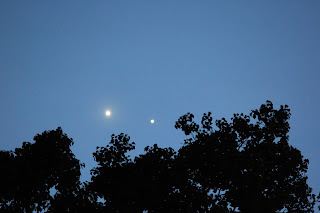 After being denied it by constant rain and clouds, I finally got a look at the grand Venus-Jupiter conjunction. It was a little past the best night—the two had begun to pull apart—but, man, did they still look great. So great that on that languid summer evening I somehow got up the energy to drag a Canon DSLR and a long lens onto the deck for a few shots of the famous duo. Even more surprisingly, I thought I was finally going to get a crack at the deep sky last Saturday night. Conditions were not perfect all day, but initially the Clear Sky Clock predicted improvement at Sundown. My new GSO girlfriend, Zelda, and I had hopes of continuing my current visual project, and at 7 p.m. (Don't you just love this Daylight Savings Time?) we headed to the club darksite. Improvement? The night began with bugs and haze and evolved into bugs and clouds. It wasn't a total loss. It was a near skunking, yeah, but I was able to try the new scope at high power on Saturn in reasonably steady seeing. Verdict? I was frankly amazed at what 500 buck Zelda did with the ringed wonder. The Crepe Ring was easy, Cassini's Division was sharp and dark, there were color variations across the A ring, I thought I spied the Encke Minima at 300x (8mm Ethos + TeleVue Big Barlow), the disk was loaded with subtle detail, and Titan was a tiny, tiny disk. Before throwing in the crying towel and heading home for some Netflix, I observed M3, M53, M51 and a few others through haze. Continue my project, observing objects from Burnham's Celestial Handbook, though? Not a prayer of that. Track down Pluto as I'd planned? Don't make me laugh. As on our first Dark Site run, however, packing up my minimalist 10-inch telescope was so easy that I wasn't a bit sorry I'd given the night a try. So, what would I write about? My top sci-fi films article got an impressive response from you, and I should do a Part II. And I will do a Part II sometime, but I thought this time I’d do something along the same lines but different. This week, let’s talk about my favorite comic books. 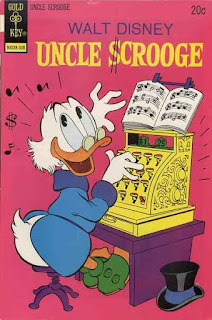 I can remember reading funny books as a little bitty kid—I clearly remember looking at the pictures in a Woody Woodpecker comic before I could read—but they were just an occasional fancy. I liked ‘em and usually saved the ones I bought when I could convince Mama or Daddy to give me a dime to spend at the neighborhood convenience store, but they did not become a passion until we were well into the Marvel explosion. My idea of comics changed in 1965. I’d actually known interesting things were happening at Marvel Comics for the past several years. 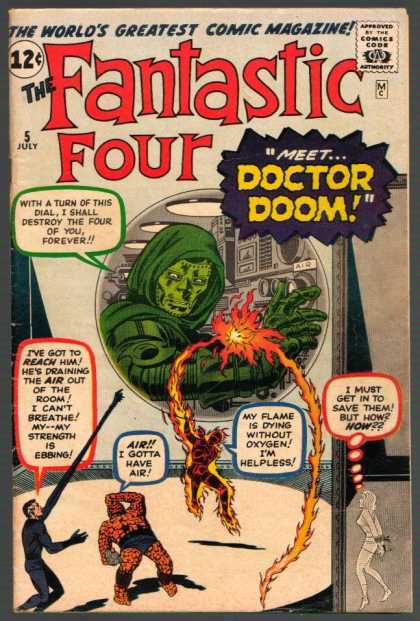 I’d got onboard with Smilin’ Stan Lee and Jolly Jack Kirby with Fantastic Four number five, which I stumbled across in Greers’ one afternoon when Mama took me grocery shopping with her. I read their magazine every month and even saved and reread the (soon tattered) issues, but comics were still not a huge deal with me. Until I realized a couple of things. First, that what was coming out of Marvel Comics was crazy good. Amazingly good. Especially considering the fact that, pre-FF, the company had been known for—to me, anyhow—second string monster/scary books. Secondly, that I’d better start keeping up. There were new Marvel titles sprouting on that fabled comics rack (“Hey Kids! Comics!) every month and they looked great. Finally, and perhaps most illuminatingly, one day in the late 60s, I came to the realization that comics were something I’d love my whole life, not just kid stuff. It was at about that time that I discovered and began drooling over a very special magazine, the late, lamented Rocket’s Blast Comicollector. I am still here reading comics. They aren’t twelve cents anymore, and you can’t buy them at the convenience store, but they are still good. Maybe better than ever. That said, my reading habits have changed. I am mostly a DC guy now. The only Marvel book I pick up regularly is, natch, given my somewhat juvenile sense of humor, the new Howard the Duck. That has nothing to do with nostalgia or anti-nostalgia; it is because of two things. Mainly, DC’s heroes seem to speak more to my current self than the Marvel guys do. It is also because—and it doesn't matter why—I had the misfortune to lose my Silver/Bronze Age Marvel collection in the early 1990s. I started over with DC, spurred on by my love of Swamp Thing and Watchmen, and that is where I still am today. No hero means as much to me at this stage of my life as The Batman. In my youth, I identified most strongly with poor put-upon Peter Parker. Today, being a little older, it's Batman striding the dark rooftops of Gotham, dealing with the night’s demons, both internal and external. I read Batman often before I began collecting comics and, surprisingly maybe, stopped when I did. You see, my coming of age as a fan/collector coincided with the Adam West TV show, the famous Batman series of 1966. It’s fashionable today to look back on Batman fondly. DC even has a book that replicates it, Batman ’66. But you know what? I never could stand it. Its camp take on the Dark Knight was heresy to me then and it’s heresy to me now. I can’t get past that to the fun, I’m afraid. I do think the Barris Batmobile is beautiful and always will be (my other two faves among Bats’ many vehicles are the Batman: the Animated Series Batmobile, and the new one in Arkham Knight). 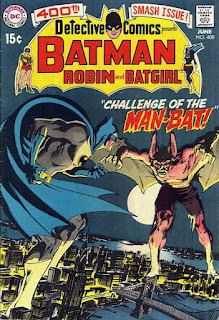 What saved Batman for me was the Neal Adams issues of the 70s. DC, to their credit, realized the short-lived TV show—it wore out its welcome in a mere two seasons—had put a hurting on the comic. Batman and Detective Comics went back to a darker more serious tone on the way to becoming darker and more serious than they had ever been. At first, I was kinda embarrassed to be reading Batman, but as the ears on the cowl grew longer and everybody in the book began to refer Bruce as THE Batman, I got over that. 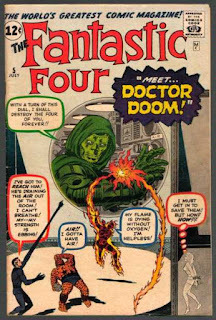 Stan Lee and Jack Kirby’s FF was for many years the be-all and end-all of comics for me. In some ways it still is, and I still reread those 100 plus Kirby issues on occasion. While I no longer have my Silver Age FF books, I’ve got them all on a DVD. This comic book was just so good because it was just so different. Oh, we’d seen the Four’s powers before on many other heroes. It wasn’t that; it was how real these characters, Reed, Sue, Ben, and Johnny, seemed at a time when Superman was plain ridiculous, playing with tropes like Super Monkey and Super Horse, and Batman was almost as bad. The FF were real. They lived in a recognizable New York City, not some mythical metropolis. They bickered. They left the team in a huff. The public didn’t worship them, not always. And that Kirby art? His Golden Age work on Captain America is beloved of many fans, but I never quite got it—I’m not a Golden Age fan of any kind, admittedly. But over those years of doing the 50s monster books and other stuff, he matured. The second I laid eyes on his work on FF, his pencils became the standard by which I judged all other comic book artists. FF today? There is no FF. Surprisingly, with another Fantastic Four film in the offing, Marvel has cancelled the book. Since the film shows signs of being a stinker (Doctor Doom is not a super-villain, but an alienated computer hacker), that might not be a bad thing. Not that I consider the cancellation much of a loss. When I’ve looked in on the team over the last decade, they didn’t much resemble the FF I loved. Will they ever be back? Sure they will be; in comicdom nothing is forever. When Marvel does bring back their book, I hope it is with some of the power of old as represented by Lee/Kirby. When I first became obsessed by Marvel, I preferred the FF’s sci-fi-ish stories to the more crime-drama-oriented slant that often maintained in Stan’s and Steve Ditko’s The Amazing Spiderman, but I was still powerfully drawn to the character. Why, he was a nerdy little kid who had a tough time in high school, just like me. Stan must have written the book with me in mind (said ten million lonely teen boys). Spiderman was never my favorite comic, but it was always one of my favorites. These days, when I pick up an issue, I still feel some of that old magic. Today, I relate more to the tortured Bruce Wayne than the picked-on Peter Parker, but, yes, when I can figure out which Marvel spider book is the one about the Peter Parker Spiderman, the character still resonates. I was there for Avengers #1 in 1963, and loved it from the beginning. Back in that hallowed day, I was also a fan of the Justice League, but I had to admit this new team from The House of Ideas was, like the FF, blessed with a measure of reality that the JLA often lacked. Like the FF, the Avengers argued, they quit, they wondered where their next dime was coming from (well, Tony Stark didn’t). It was, again, great. Actually, there’s not one Avengers. The team’s lineup has changed frequently over the years. My favorite? Surprisingly, not the team that debuted in Number One. My favorite is the late 60s group: Cap, Hawkeye, Scarlet Witch, Quicksilver, Vision, and Hercules. As Stan quickly found out, having Hulk and Thor in the group was a no-go. Who could stand up to the combined might of the Son of Odin and “Hulk Smash Little Men”? I’m sure old Smiley got tired of the constant dodges that had those two off somewhere or compromised. I haven’t read the Avengers in a long time, but you know what? Seeing the movie made me want to spend a little time with my old pals. I may pick up an ish on my next visit to the comic book store. In the early 1970s, I was Marvel superhero crazy and thought honest-to-god funnybooks were a thing of my childhood. Not so. 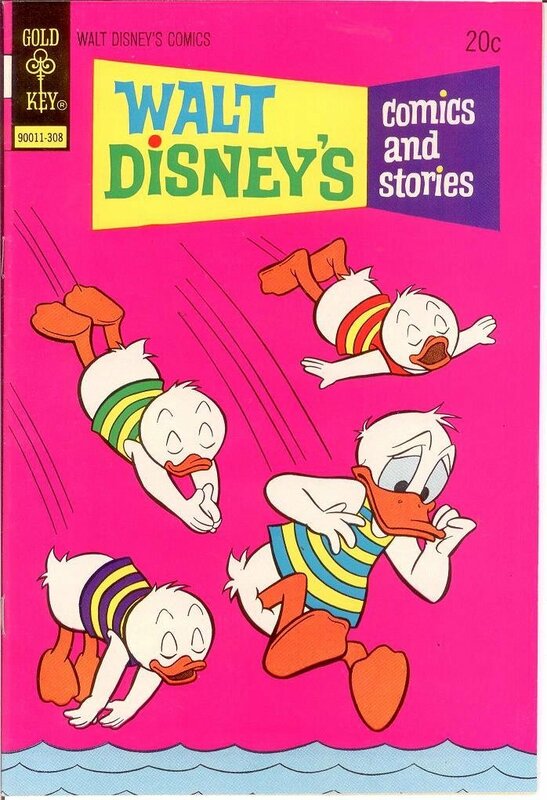 Someone very dear to me introduced me to the Disney duck books and in particular the reprints (which I believe were mainly what appeared in the 70s issues) of Carl Barks' stories. Everything about his work—his stories, his art, his layouts—was top-notch and hardly only for kids. Outstanding. Memorable. Engaging. Funny. Today the Comics and Stories of Barks is as fresh and (often) witty as ever. Another Gold Key Disney title with his work, Uncle Scrooge, was frequently as good or even better. The amazing thing about Barks' ducks? Their stories aren't just "cute" or funny. My sense of wonder is often stimulated by them. When the ducks go on an adventure, it feels that way—like a real adventure. I always liked Thor, and was onto the book not long after Marvel put the Norse god in their former scare title, Journey into Mystery. The Kirby issues are fantastic, and the comic maintained itself with good grace for many years after his departure and with the transition of the hero to his own title. Funny thing, though? What I really loved all those years ago was not the main title, but the little featurette, “Tales of Asgard,” Which brought us Thor’s questing, carousing friends, The Warriors Three: Fandral, Hogun, and, most of all, The Voluminous Volstagg. One of my fond memories of those days is a summer afternoon spent at the swim club, sitting under an oak tree at a picnic table with my best buddy reading Journey into Mystery, talking comics, and eating the lunch Mama packed me in a paper sack. I haven’t read Thor in a long time, maybe because I am afraid of sullying that memory, but I have enjoyed his films. There is no graphic novel as respected as Alan Moore and Dave Gibbons' Watchmen. Even the hoity-toity New York Review of Books had to admit it is CRAZY GOOD as literature. And it is. I discussed it in the sci-fi movies article not long ago, so here I will just say this book—which, some people forget was initially a series of monthly comics—is everything comic books should and can be. Its tale of alienated (Charlton, more or less) heroes is unforgettable. Didn’t mention it above under “Spiderman,” but I was a huge fan of Spidey's artist, Steve Ditko. 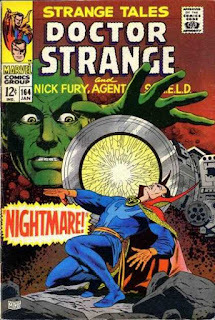 His style was utterly different from that of my main man Kirby, but it was right for his books and especially Doctor Strange (in Strange Tales). He could go hog-wild with his weird psychedelic panels and odd character appearances and expressions and it fit. Oh, and I liked the character, too. Doctor Stephen Strange—Marvel’s version of Doctor Fate, I guess. Above and beyond his mastery of the mystic arts, it was Doc Strange’s competence that impressed me. He was steady and smart and knowledgeable in the face of baddies that could destroy the world. Reassuring in the days when we were all at least subconsciously afraid of someone doing just that with the push of a button. While I love Ditko’s work on the book, my favorite issues are actually by Dan Adkins. I remember very clearly Daddy stopping to get gas at Pak-a-Sak when our family was on the way to the Greater Gulf State Fair one fall night. I walked inside, found a luscious Adkins Doc Strange, and, surprise, a dime and a nickel to pay for the 12 cent comic in my pocket. The big deal, though, was that when we got home and I read the issue, I noticed Stan’s mention (in his “Stan’s Soapbox” column) of this book called The Lord of the Rings. Before long I was seeking that out and being swept away by it thanks to old Smiley. Ah, memories. The other Strange Tales feature in those days was “Nick Fury, Agent of Shield,” Marvel’s attempt to cash-in on the James Bond/Man from UNCLE secret agent craze (I am lucky in that I still have Strange Tales 135, which is Nick’s first appearance). I liked Stan’s and Jack’s S.H.I.E.L.D. well enough, but the series didn’t really take off for me until Jim Steranko took over with Strange Tales 151. If there was a competitor for Jack Kirby in those days for me it was Jim. His art—and his writing—were over the top powerful. I’ve got his run on Nick Fury in graphic novel form, and you know what? Like Kirby’s art, it holds up amazingly well today, looking as fresh as ever and maybe even less dated than that of the Jolly One. I don’t believe Marvel has a Nick Fury book at the moment, but maybe they will. The S.H.I.E.L.D series on TV is popular, and Nick’s (or is that his son?) appearances in the Avengers films have caused quite a bit of renewed interest in the character. One of Marvel’s other former anthology books was Tales of Suspense. Which after the coming of the heroes began featuring Captain America, the revived spy-smasher and Nazi-buster of the Golden Age. I loved Cap. Not just for the Kirby art and outrageous stories like his battles against Modok and A.I.M., but because, unlike most other Marvel heroes, there was not a tiny trace of anti-hero in Cap. In the heyday of conflicted heroes in movies and even comics, Cap stood out because he was different. He was a Good Guy, good to the core. He knew exactly what was right and you could depend on him to do it. Like many other comics heroes, Cap has been retconned a few times. He’s not even Steve Rogers anymore. That’s OK. As is the case with the other Marvel heroes, I have my memories and a few old comics. As above, I live mostly in the DC Universe these days, but some of my best comic-reading experiences have to do with Cap and Tales of Suspense. It wasn’t ever only Marvel, or Marvel and DC, for me. I often bought titles from the sometime looked down upon (back then, anyway) Gold Key, Western Publishing’s comic book outfit. 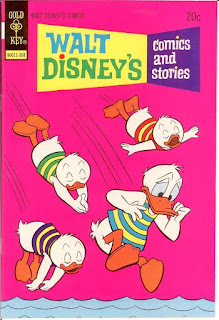 At the top of my list of their books, which included the Disney titles, were “painted cover” comics like writer Del Connell and artist Dan Spiegle’s Space Family Robinson which came out of an idea by Carl Barks. Which was a great idea for a book. What you’ve got under a variety of competent artists and writers is the Swiss Family Robinson set in outer space. It was such a good idea that CBS borrowed it (without explicit credit) for Lost in Space. The comic doesn’t hold up quite as well as I’d hoped today—though it holds up much better than the TV show—but what a lot of fun it was. Even as an older teen—or even today—I never quite lost my love for jungle stories. Bomba. Jungle Jim. Sheena. Most of all, Tarzan. The Tarzan comic I loved and still respect the most was the Gold Key version done by stupendous artist Russ Manning (Magnus Robot Fighter). Not only did the books look great, they were frequently literate, often adapting the real E.R. Burroughs stories. The good Tarzan issues are just as good as they ever were. Still fresh in my mind is the summer day when Daddy dragged me along to Air Force MARS (Military Affiliate Radio System) Field Day, an emergency preparedness test. I wasn’t much interested in that, but the day was saved by the new Tarzan and a stack of older ones (and Koraks) I brought along. The Spanish Fort, Alabama woods suddenly became the wilds of darkest Africa. I never much liked Batgirl. Not in the 60s, not in the 70s. She always seemed like a supercilious little twit to me. 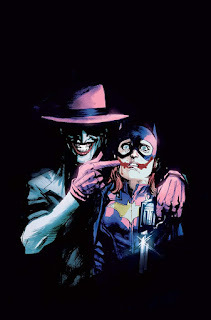 That changed with the events of The Killing Joke, after she was paralyzed when the Joker shot her in the spine. Her evolution into Oracle, and, then, her rebirth as Batgirl with DC’s New 52, interested and moved me. Today, her book, which has brilliant art and a fresh tone of urban hipness, is a comic I read every single month. I suspect that after next year’s movie a lot of you will become readers of DC’s New Suicide Squad. Me? I’ve been enjoying Task Force X’s often convoluted triple-cross tales since the 1980s. The concept is (almost) always the same. Amanda “The Wall” Waller runs covert missions out of Louisiana's Belle Reve Penitentiary. The members of the so-called Suicide Squad are convicted supervillians looking to work time off their sentences doing impossible missions for Waller’s shadowy arm of the Government. In the old days, Batwoman was “meh.” A female bat designed to take the heat off Batman. Heat applied by that infamous imbecile, Dr. Frederic Wertham. How could Batman be gay as the silly Wertham told us he was? He had a girlfriend, Kathy Kane, who was also a crimefighter. That was all Batwoman was for years and years. Until 2006, when she was reimagined in dramatically different fashion. This Batwoman, Kate Kane, is an independent crime fighter, hardly a member of the Bat Family, and often at odds with Batman. Kate is of Jewish descent and is, ironically given her original reason for being, a lesbian. 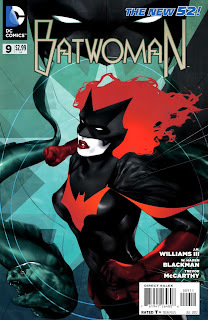 While the book has been, in my opinion, mishandled in recent times, which has led to its cancellation, Batwoman is a terrific character and I hope to see her make a comeback soon. I wasn’t there for X-Men #1, but I was there early on. I didn’t really begin to love the book until my college days, though. If Spiderman moved me in high school, it was X-Men who did that in college. In the 1980s, X-Men was, along with Swamp Thing, my favorite comic. In recent times, I’ve lost touch with the merry mutants. Maybe because of the bewildering (to someone who doesn’t do much Marvel anymore) proliferation of X-books, but mostly because of the events of Marvel’s Civil War. Still, if I were to pick a Marvel comic to start reading again, it would probably be an X-Men title. 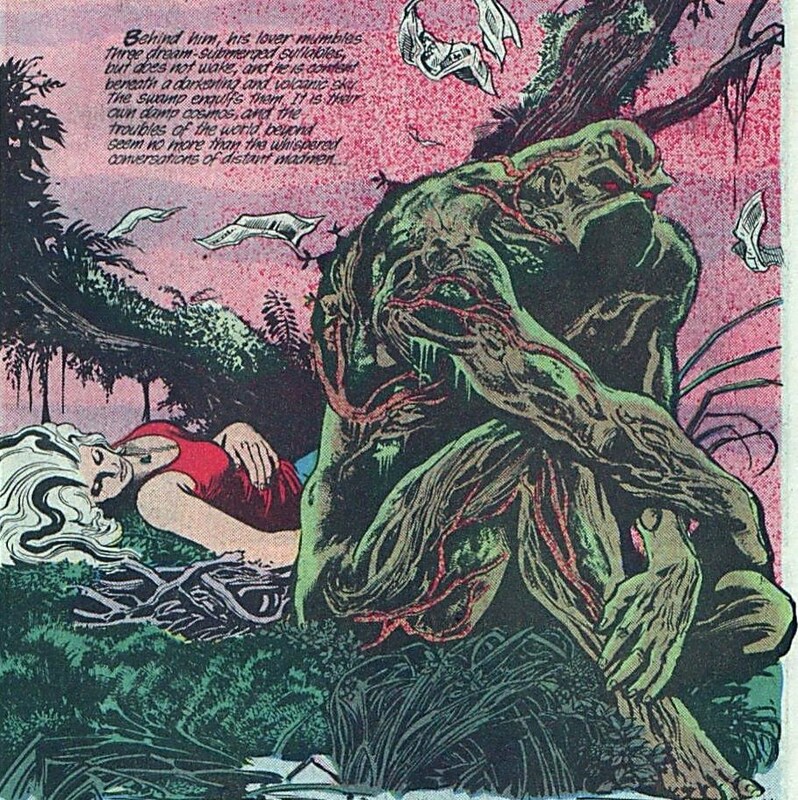 Swamp Thing has always been one of DC’s best titles. He was great in the old days when Bernie Wrightson was doing him, and he was great in his pair of Convergence books just the other day. What made him for me, however, was the incredible 1980s run of Alan Moore and Stephen Bissette (pencils). Their stories about the humongous lump of a plant man weren’t just interesting, as they’d always been, they were suddenly lyrical. Swamp Thing stopped being a somewhat ridiculous monster, which was all Marvel’s equivalent, Man-Thing, ever was and became more human than the humans around him. What’s truly remarkable about ol’ Swampy is how well he’s always held up despite ever changing artists and writers. Heck, even the el cheapo 1982 movie is surprisingly watchable. Not bad, anyways, and there is Adrienne Barbeau to look at, of course. Where am I with comics now? I am as into them as ever, and this is a great time to be into funnybooks. DC heroes rule our TV screens, and the Marvel gang dominates multiplexes this summer. If you haven’t picked up a comic in a while, why not trot to your local comics shop and give a couple a try? If you do decide to pick up some comics, which I hope you will, please get ‘em at a comic book store run by people who care about comics rather than at freaking Barnes and Noble or Books-a-Million. Anyhow, let’s see how many comics collectors/fans there are out there in astronomy land. If I get a good response on this, I’ll plan a Part II of this one as well. There are so many great books I didn’t even mention. JLA…Legion…Teen Titans…Daredevil…Iron Man…Sandman...and on and on and on... Till then? "Excelsior!" of course. I’m conflicted about Pluto. 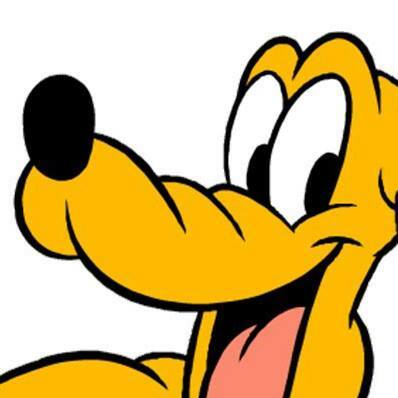 Oh, not Pluto the Disney dog. I love that Pluto just like I love (almost) every other Disney character. No, I am talking that pesky little dwarf planet. The former ninth member of Sol's family and I have a rather complicated relationship. That relationship began when I was a youngster, a proto-amateur astronomer. Like the rest of my generation, I learned all about The Sun’s Family of Nine Worlds early in elementary school to include memorizing the names all of 'em. Kinda tough for the little folk, but required in the space crazy days of the nineteen sixties. Luckily, there was a mnemonic many of us still cherish: My Very Educated Mother Just Showed Us Nine Planets. When I stopped being a proto-amateur and became a real one, I naturally wanted to see all of The Nine. I only got eight; Uranus and Neptune were more than challenging enough for my little telescope. I wanted to see Clyde Tombaugh’s and Percival Lowell’s world, but I set that aside for “someday.” Not only will it not show a disk and is, therefore, only identifiable by means of comparing the star patterns in an eyepiece to those of a detailed finder chart, it has a somewhat punishing visual magnitude that usually hovers around 14 (it can vary from about 13.5 to all the way down to 16). That was way too dim for my 4-inch Palomar Junior and still too dim even when I moved up to a 6-inch home-brew Newtonian. To corral Pluto, you need at least an 8-inch telescope, and as a young teen I couldn’t dream of owning such a huge instrument. Hell, the Edmund Scientific 8-inch Newt was well over 400 dollars with shipping. This in the days when your old man might bring home 200 a week if your family was firmly entrenched in the middle class. 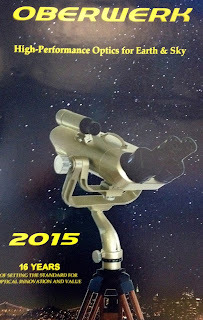 So, Pluto had to wait for well over a decade, till I glommed onto my first Celestron C8 Orange Tube SCT. Actually, it took me quite a while after I got that scope to get around to chasing Pluto. What finally impelled me to do so was the prospect of moving back to Mobile, Alabama. I knew the dark skies of the Ozarks in Arkansas where I was living would make the hunt far easier than the soupy, humid skies of home. An 8-inch is big enough for Pluto, but you know what? It is just barely big enough. At magnitude 14 and change, which he was at when I went after him, and which he is at now (14.1 to be precise), he’s in range of an 8-inch with clean optics and dark skies. But easy? No. At about 300x I thought I saw a pinprick in the correct position using Sky & Telescope’s yearly finder chart. I even imagined the speck had moved when I came back a week later. Maybe. Not to be a party pooper, but, frankly, Pluto was probably even a little easier then than now. He was located away from the summer Milky Way where he is positioned at this time. There were fewer “comparison” stars to use when checking for movement, but there were also far fewer field stars to masquerade as that silly little dwarf than there are today with him over in freaking Sagittarius. Well, every party needs a pooper and that’s why they invited me. Let me take that a step further. If you want Pluto to be reasonably easy, especially under less than perfect skies, you want to look for him with a 16-inch. Which was my takeaway from the 1999 Texas Star Party. That May, Pluto was actually slightly brighter than he is this month, being at 13.73. Which didn’t sound too bad. I’d have my 12-inch Dob, Old Betsy, and I’d have the pristine skies of Prude Ranch. I put Pluto on my observing list. “Easy-peazy,” I thought. Hah. When I got the scope pointed at the proper area of Ophiuchus, I began studying the field in the 12mm Nagler, which, in concert with the 2x TeleVue Big Barlow, which was my big buy at the ’99 TSP, delivered 250x, a pretty good Pluto power. I looked in the eyepiece, and I looked back at the very detailed chart I’d printed with Megastar (software). Nothing hopped out at me that might be the last stop on the way to the Kuiper Belt. I looked some more. After about 15-minutes I spied the minutest, most fraking insignificant speck that appeared to be in the correct position. No, magnitude 13.73 theoretically isn’t that dim in a 12-inch under good skies and with medium-high magnification, but it sure looks dim when it’s just a “small” star in a crowded field. I will say that when I came back a couple of days later to verify Pluto had moved (via the quick field sketch I’d made the first night), it was somewhat easier to find and see him. But easy in a 12 even under the near perfect skies we had that year? N-O. Not for me, and I suspect not for you. Yes, people say they’ve seen him in a 5-inch, but I am dubious. That would take perfect eyesight, pupils dilated to the max, perfectly dark skies, and very steady seeing—any wavering will make the pinprick that is Pluto disappear. Again, if you want “easy," I’ve got to say a 16-inch is the way to go. Do you really want easy, though? Pluto isn’t much to look at. In fact he isn’t anything to look at. Just a dim point of light. I believe a little bit of a challenge is called for to make finding Pluto a fun endeavor. If your skies are not perfect, hunt him with a 12 or a 10-inch. If your skies are (near) perfect, and especially if you’ve got considerable observing experience under your belt, haul out an 8-inch. What with the New Horizons spacecraft approaching Clyde’s Rock, the hunt will be especially fun this July and might be a way for energizing your club during the summer doldrums. Taking a cue from SkyTools author Greg Crinklaw, who suggested to the SkyTools Yahoogroup that chasing Pluto would be an interesting endeavor with NASA’s probe only weeks away, I’ve challenged everybody in my club who owns a 10-inch or larger telescope to try for the dwarf planet from our dark site. When the spacecraft reveals the weird and wonderful (as it no doubt will) when it comes closest to Pluto and his satellites on July 14th, it will be extra special for those of us who are in the very tiny minority of humans who’ve laid eyes on the world with their own eyes. No, he’s not very far away when compared to the distant galaxies many of us observe, but he is small and is out there on the edge of the Solar System and it is an undeniable thrill to say you have tracked him down. What will I use for my Pluto quest? I’m going for the gold, y’all. 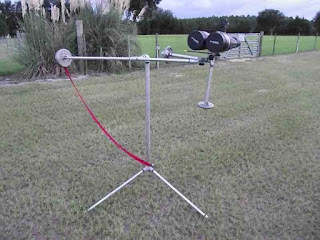 I will initially attempt the observation with my 10-inch Dobsonian (Zelda). Since I’ve seen Pluto before and know what to expect, I think I can do it if the skies cooperate. The main impediment, I believe—assuming we get some relief from near-constant clouds and rain—will be the terrific haze. If I miss, I’ll kick it up to my 12-inch (Old Betsy). If still no PL do I see, I will get a buddy with a larger scope to put Pluto in the field. Ain’t too proud to beg. Seeing Pluto in concert with New Horizons' arrival is a once in a lifetime opportunity. Any tips I can give novice Plutophiles running down the rascal for the first time? Other than "pour on the aperture," use plenty of magnification. Especially if your skies ain’t perfect. 200x to 300x is a good power once you have (you think) Pluto centered. And don’t be hasty. Don’t just take a 2-minute look in the eyepiece and decide “noseeum.” Spend a half hour minimum before throwing in the crying towel. How can you be sure you have seen Pluto? The time-honored method was to draw the field and come back in a few days as I did at TSP. Even then, however, that really wasn’t necessary any longer. A highly detailed chart for your date, time, and location produced with a computer, showing stars down to the limit of your scope, will probably allow you to pick out Pluto without doubt. In those days I used Megastar. Today it is SkyTools 3 or a new favorite, a freeware planetarium, C2A. Don’t have nuttin’ but an 8-inch or smaller scope? If you have a camera of some kind, a DSLR or a CCD or a deep space video camera, imaging Pluto is like shooting fish in a barrel if your goto is accurate enough to put the dwarf in the frame of your sensor. If I fail visually, I might break out the Mallincam Xtreme and the Edge 800 (Mrs. Emma Peel). For a rig that can bring back 17th magnitude galaxies, Pluto ain’t nothin’ (not a thing). What else is there to say about Pluto? There is that elephant in the living room. He is the world who got demoted. Who the IAU reduced in status from major planet to dwarf. A lot of folks got upset about that. Not just amateur astronomers, who tend to become emotionally invested in such things, but even the general public. Some couldn’t find enough bad words to aim at Neil Tyson, who came out strongly in favor of ending The Nine some years ago. Why all the hubbub, Bub? I often wondered about that. So I decided to find out. Who better to ask than the students in my university astronomy labs? PH101 is to some extent a “service course,” drawing students from majors ranging from math and physics to art and P.E. and that seemed the perfect group to ask. I don’t know a thing about doing surveys, so I just asked the kids a few (written) questions. "Have you heard the International Astronomical Union no longer classifies Pluto as a (major) planet? Do you agree with that decision? Why or why not?" Reading the answers my students gave made one thing clear: even among the most scientifically literate, science had little to do with Pluto. It was all about emotion. When I boiled it all down, there were two reasons students felt sad for the hellish little world. First, like me, they had fond memories of learning The Nine in elementary school. Secondly, they seemed to at least subconsciously conflate this lonely little world with Disney’s friendly cartoon dog. That last seems strange, but I tend to do it too. When someone says “Pluto,” the first image that pops into my mind is not some godforsaken rock, but Mickey’s faithful hound. What do I think? As an astronomy educator at a university, I straddle the worlds of professional and amateur astronomy, but I have to come down with most professionals on this one. 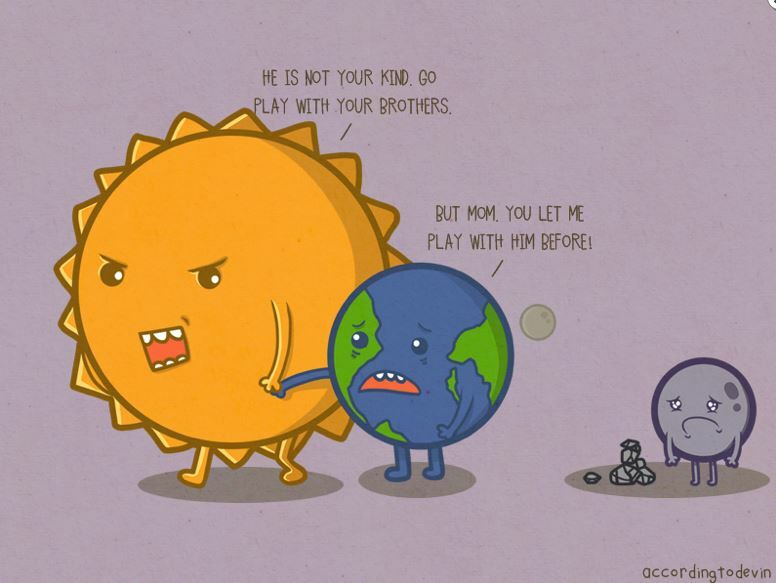 Considering Pluto the same sort of world as the major planets is just silly. To begin with, he is tiny, 1471 miles in diameter, which is smaller than Earth’s Moon. Why was he ever considered a major planet? Initially, it was thought Pluto was somewhat larger than Earth. Maybe as much as twice the size of our home world. Over the years, he’s been continuously downsized. Every time we’ve learned more about Pluto, he’s gotten smaller. Secondly, Pluto’s orbit is fairly highly inclined to the ecliptic. He is well out of the plane shared, more or less, by the eight big guys. What does his orbit (which crosses Neptune’s path) look like? It looks like the orbit of a comet or asteroid. Then there’s the company he keeps. If there were only one world like Pluto out at the edge, I suppose a better case could be for keeping him in the family, but that is not the way it is. There are plenty more where he came from like Sedna (who may be slightly larger than Pluto). Eris and Makemake are pretty clearly bigger than poor PL. There are no doubt thousands of Kuiper Belt Objects, including some that are indeed larger than Pluto. Should the kids have to memorize The Nine Hundred? What is there in Pluto’s favor? Several cases for retaining him have been made. For example, Pluto has moons. Just like a major planet. But some asteroids have Moons, too. Frankly, most pro-Pluto arguments are, just like my students’ responses, based on emotion. The ground truth is that Pluto is just different from the Sun’s eight major planets. Frankly, I’m weary of the Pluto dust-up. I’d be OK with it if the IAU decided to grandfather him back into major-planet-hood. But even if they don’t, who cares? If you want Pluto to be a planet, he’s a planet. Who cares what a (poorly attended) IAU session came up with? Frankly, they fumbled the ball so badly on Pluto, especially PR-wise, that I wouldn’t be surprised if they revisit the issue someday.